Going into Jobs, my knowledge of the Apple backstory was somewhat – but not entirely – limited. I was marginally prepared to judge this film due to an underrated little piece of cinema titled Pirates of Silicon Valley, an epic adventure that is succinctly described by IMDB as “History of Apple and Microsoft.” But in truth, it is so much more. You may be wondering to yourself how such a film could have escaped your radar. Sadly, 1999 made-for-TV TNT films tend to be overlooked. While Pirates has a real ‘90s feel about it in a film-making sense (dream sequences, quality dialogue, etc. ), it neatly outlines the genesis of personal computing. It entertains and sustains audience attention; it moves quickly and wraps itself up in a tidy 95 minutes. As if things couldn’t get any better, Anthony Michael Hall plays Bill Gates, while Noah Wyle portrays his arch nemesis, Steve Jobs. This is the epitome of made-for-TV gold. I watched Pirates of Silicon Valley in preparation for Jobs. The only thing I knew about Steve Jobs was that I was grateful he had created the iPhone. Had I seen Jobs and Jobsalone, that knowledge would only be slightly increased to include the following facts: 1. Steve Jobs walked like a turkey 2. Steve Jobs was not a pleasant human being. Ashton Kutcher storms through the various scenarios of Jobs’ life and career. He acts passionately, persistently, and then on the verge of tears. The camera typically focuses on the back of his head as he awkwardly roams around buildings. Every time this occurred (which was often), I kept hearing Jurassic Park’s Dr. Alan Grant describing the movements of a velociraptor: “He moves like a bird, lightly bobbing his head.” That pretty much sums of Kutcher’s entire performance, except he bobs his whole body as he stomps around being oh-so-passionately misunderstood. For 128 minutes. 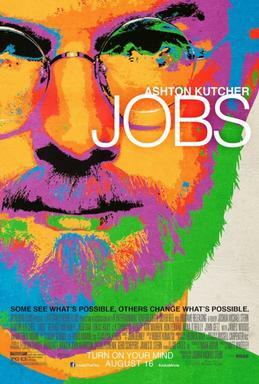 Jobs has no linear storyline. For 128 brutal minutes, we are treated to a strange montage of key moments in the man’s life and career. Armed with a wealth of information fromPirates, I couldn’t help but notice a glaring hole in the already-lacking plot – what happened to Microsoft? I learned from Noah and Anthony that Apple and Microsoft’s stories are so intricately entwined that they have to be told together, yet Bill Gates is notably absent from Jobs. There is one time that Jobs calls Gates to passionately yell while on the verge of tears, but that’s the only mention of Bill Gates in the entire film. I will never get back those 128 minutes. I will never be able to rid my memory of that velociraptor/turkey walk. I will never understand why no one asked Noah Wyle to step back into the role he was born to play. These questions will never be answered. These scars will never heal. I can only hope that the pain of the Jobs film experience will someday fade away. Cue the montage, I’m on the verge of passionate tears.